In the midst of what will probably be my busiest, craziest, jam-packed summer ever, I had the opportunity to go to my very first Food Blogging Convention. 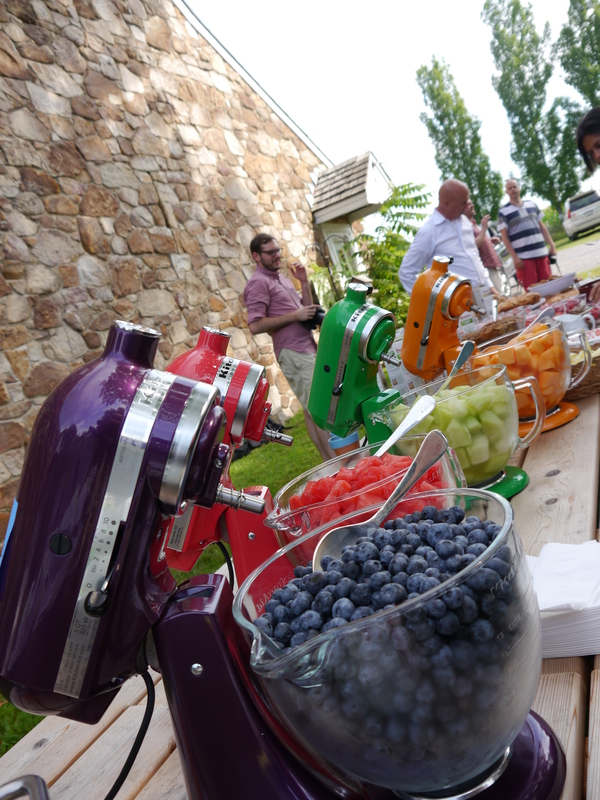 The Big Summer Potluck this year was all about investing in yourself. Believing in yourself. This is a lesson I know we all could listen to every now and then. The event is a weekend with 75 other fabulous bloggers, several inspiring speakers, prizes to be won, and of course tons and tons of delicious food. I wasn’t able to get off of work in time to make it up for Friday night’s events, but Saturday morning I met my girl Allie from All I Eat Food at the hotel and along with two new friends Lisa from Jersey Girl Cooks and Kristin from Dizzy Busy and Hungry. Slowly but surely we made our way on the bus to the Bucks County Audubon Society where we were greeted with a breakfast full of yummy baked goods, tons of fruit, and huge vats of cold pressed iced coffee. How perfect. Is this not the absolute most adorable way to serve fruit? I might have to get 4 colors to do it myself! 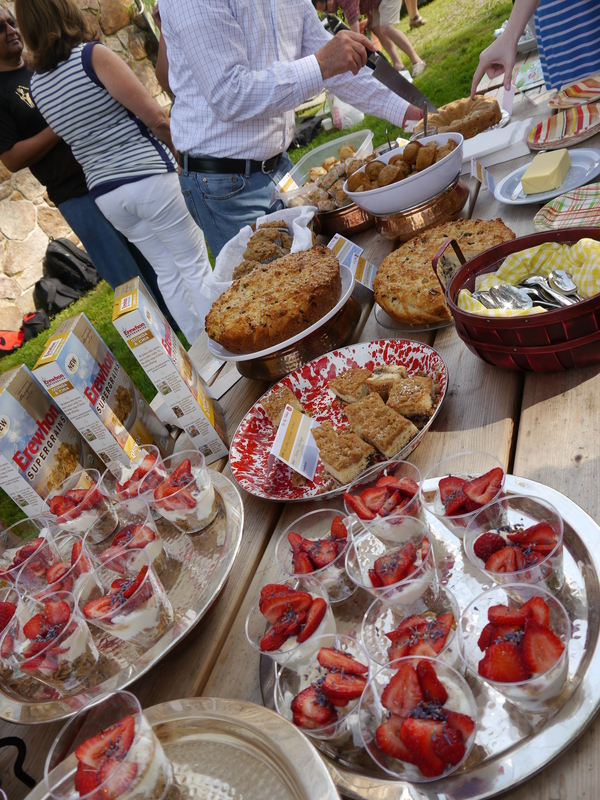 Lots of bloggers brought goodies for us all to eat. 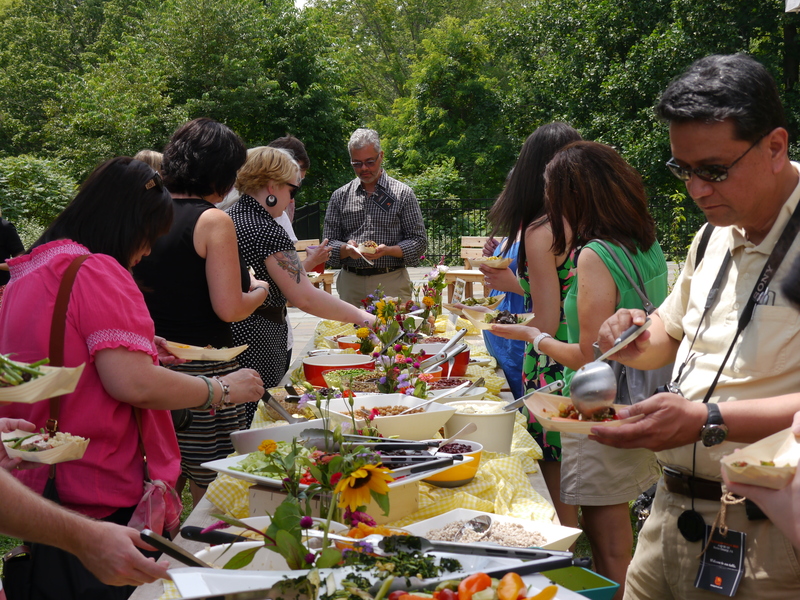 What’s a potluck without the potluck?! 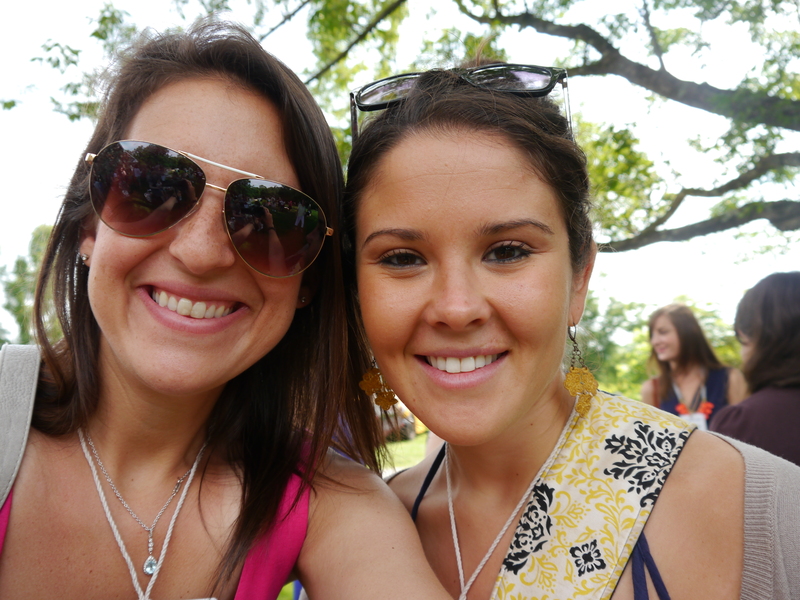 Me and my blogging inspiration/dear friend Allie! 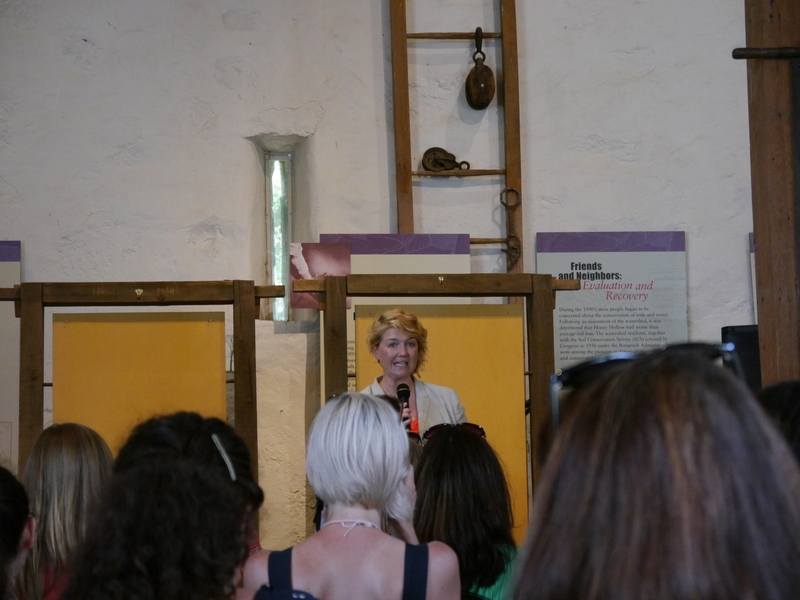 After we mingled and noshed a bit, we were directed into the barn house to get a day full of amazing speakers started. Our first speaker was Jessamyn Rodriguez from Hot Bread Kitchen in NY. 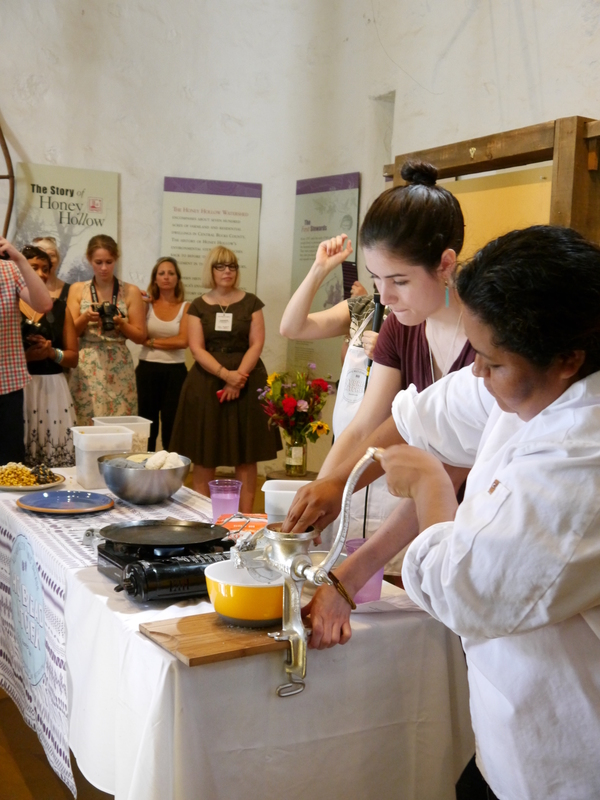 The Hot Bread Kitchen is a place where foreign and low-income women can train to begin their own businesses in the food industry. HBK funds their training and education by selling organic hand-made breads that are customary to each woman’s homeland. 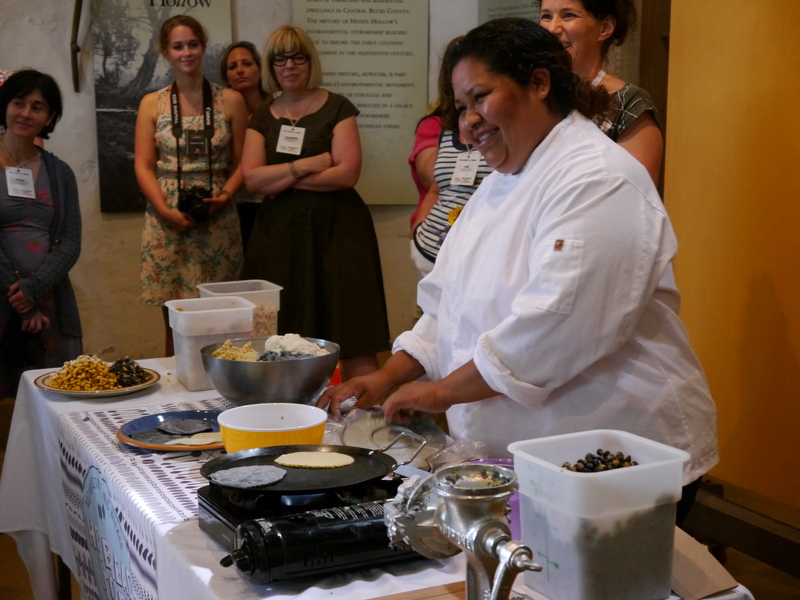 We were even able to try out fresh corn tortillas that they were making right in front of our eyes. YUM! Next up, we got to hear from Jessica Powers from whyhunger.org and a truly heroic and inspiring story from Robyn Hillman-Harrigan. Robyn started the Shore Soup Project in the aftermath of Hurricane Sandy which completely sacked her hometown of Rockaway, NY back in the fall of 2012. Robyn, along with the help of a few other people were able to organize and feed hundreds of people in Rockaway who would otherwise have had no way to find food in the destruction. Robyn and the Shore Soup Project soon found that hunger wasn’t just a problem because of Sandy, but that it was something Americans deal with on a daily basis. 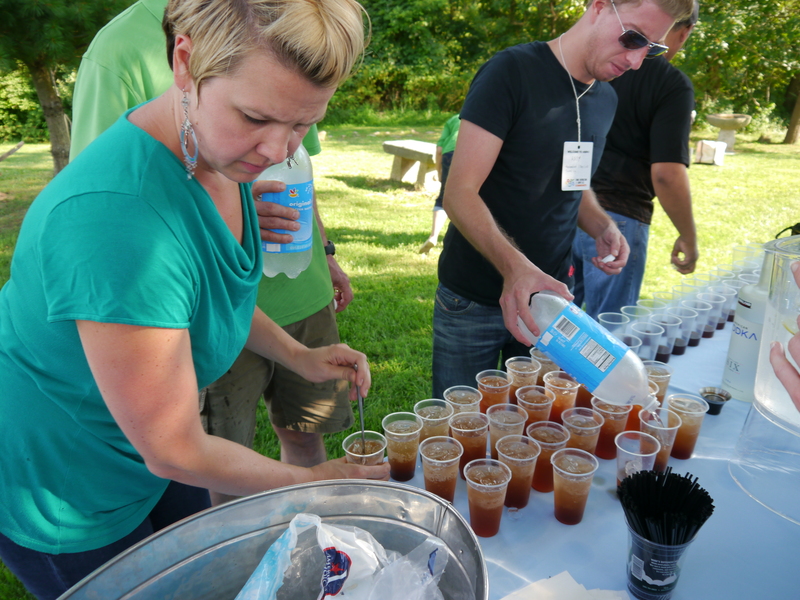 So Robyn quit her job, and kept the Shore Soup Project going even long after Sandy was gone. They now have served over 50,000 meals and run a “pay-as-you-go” Food Truck as well. Before lunch, we had a mini appetizer courtesy of a pretty awesome new appliance that I’m definitely going to have to buy. This is the Phillips AirFryer- a brand spankin’ new way to fry your food with air. Seriously, it works. We got to try Sweet Potato Fries and they were outstanding. Creamy on the inside and nice and crisp on the outside. I would never have guessed they were not deep fried! 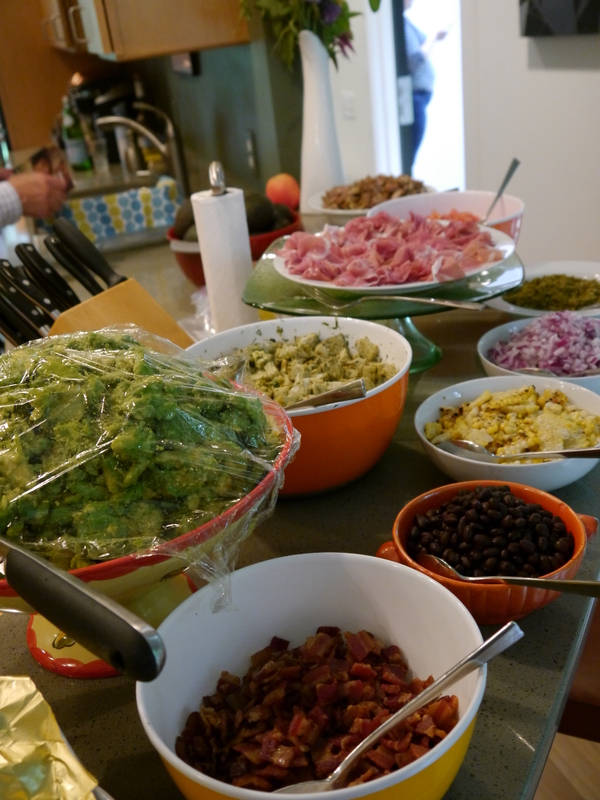 For our lunch, we were able to do a make-your-own bean/grain salad bar. The table was set up with so many different options so it was very hard to choose what I wanted! 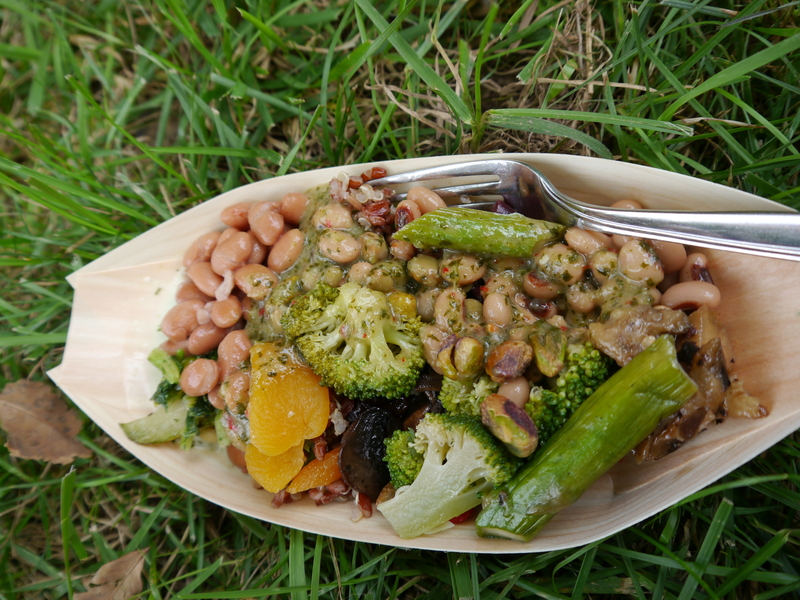 There was quinoa, farro, black beans, black eyed peas, veggies, nuts, dried fruit… the list goes on! The salads were topped off by our choice of dressings made from Gourmet Garden herbs. So fresh and delicious. Next up on the agenda was a speaker I was quite excited to hear: Jeni Bauer from Jeni’s Splendid Ice Creams. She is just awesome. I heard of Jeni’s Ice Cream a few years ago on the Food Network and have tried to convince Dave to buy me some and have it shipped from Ohio several times. 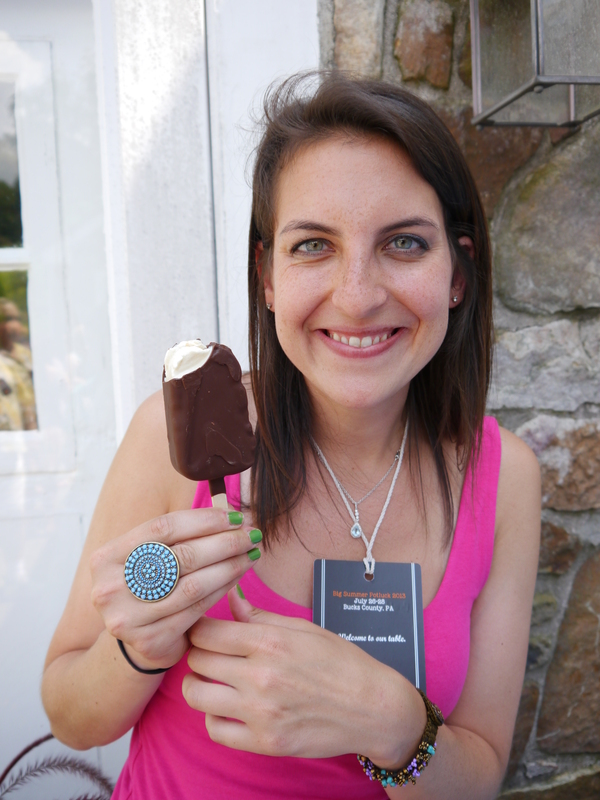 I couldn’t believe I was finally going to get to meet her (and try her ice cream!!!!)! Jeni is as fabulous as I expected, and she told us her story of how she got from whipping up Ice Creams in her college apartment to where she is now with over 13 locations. 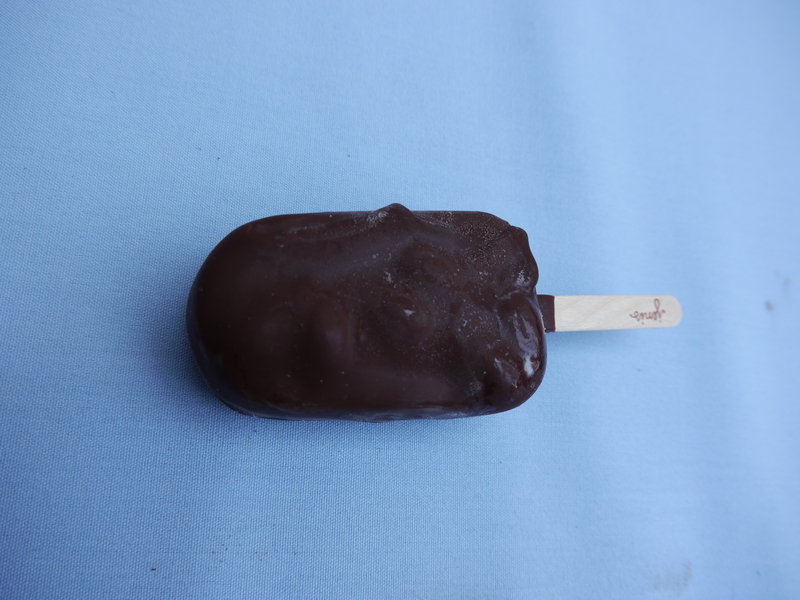 Vanilla Bean Ice Cream with Smoked Almonds and a Salted Caramel Sauce all dipped in Bittersweet Dark Chocolate. Drooling yet?! Next up was a really interesting talk about Honeybees! 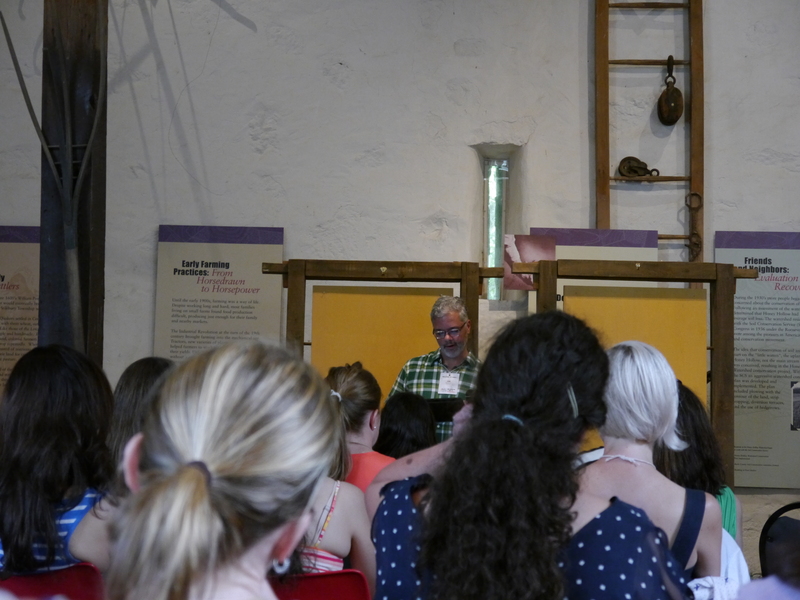 We learned so much from Coach Mark Smallwood who works with and studies Honeybees at the Rodale Institute. We even got to taste the difference (and you totally can) between a Summer and a Fall honey. So sweet! Probably one of my new favorite people- Joe Yonan was up next. Joe’s new cookbook, Eat Your Vegetables is so amazing! I was crossing my fingers in the hopes that I’d get to win one of the prize copies, but I didn’t :(! Joe told us his incredible journey in which he quit his job at the Washington Post to live with his sister and brother-in-law on a homestead farm for a year. He was able to write the inspired new cookbook and also got his job back when he returned home. You rock, Joe Yonan! The last few speakers had some pretty cool demonstrations for us before we were sent off in a whirlwind of drinking and eating and drinking and eating. 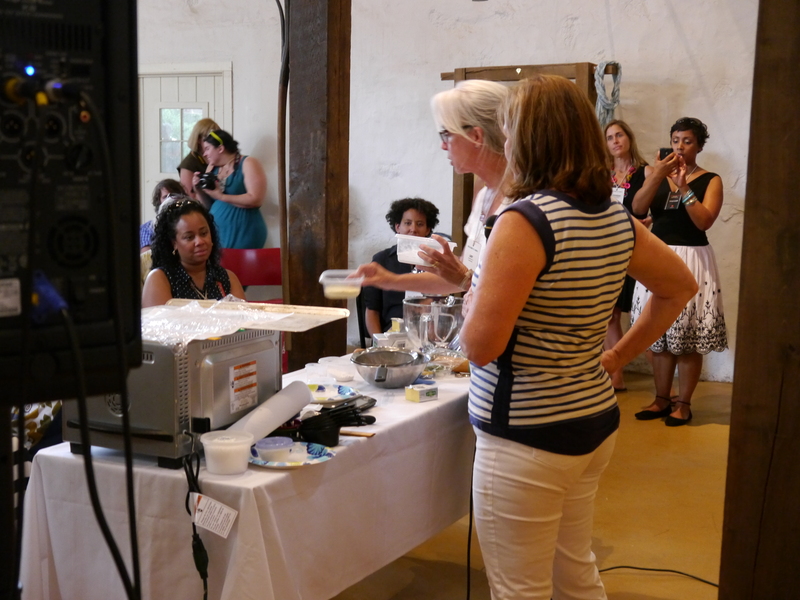 The first demo was from cookbook author Abby Dodge who made us Rosemary-Basil Shortbread Cookies that were out of this world! 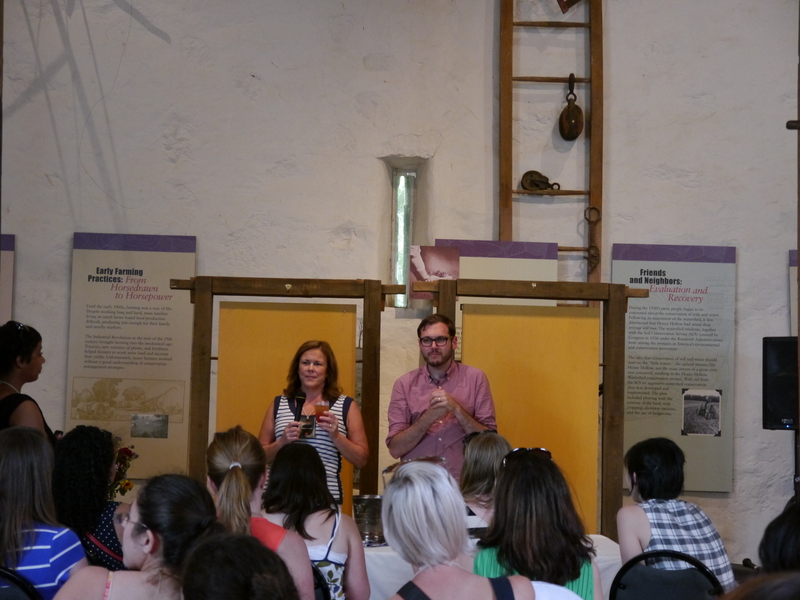 We also heard from Brian Samuels from A Thought for Food & The Boys Club, who taught us all about Shrubs- a delicious type of cocktail made with a vinegar-based syrup. Tart and tangy and oh-so-delicious, we were brought outside to have a cocktail (or two) of Brian’s Strawberry-Rhubarb Collins. Delish! Dinner was just outstanding! OMGOMGOMGOMG! I ate and ate and ate and ate some more until I was ready to burst. 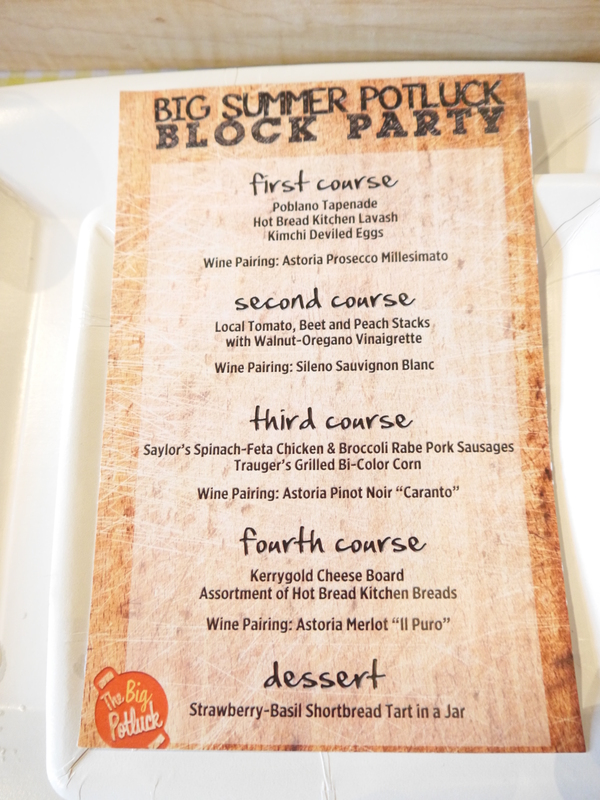 Besides all of the yummy food, each table was given a bottle of Astoria Wine perfectly paired with each dish. We had so much fun chatting and taking tons of blogging pictures with our table. 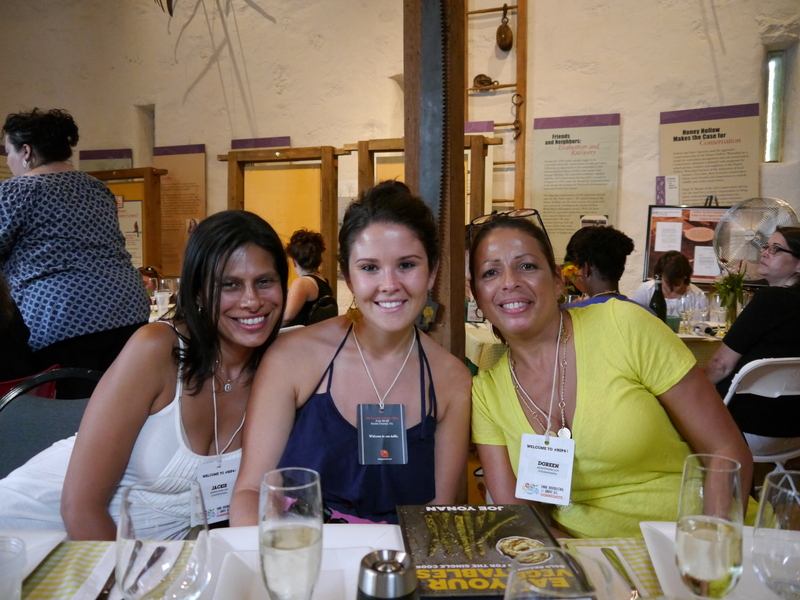 Allie and I sat with Shannon- the Phillips rep, Doreen from Gluten Free Lite, Tara from Secrets of a Momaholic, Jackie from C.A.F.E , and the fabulous Gina from Skinnytaste. Love these ladies!! 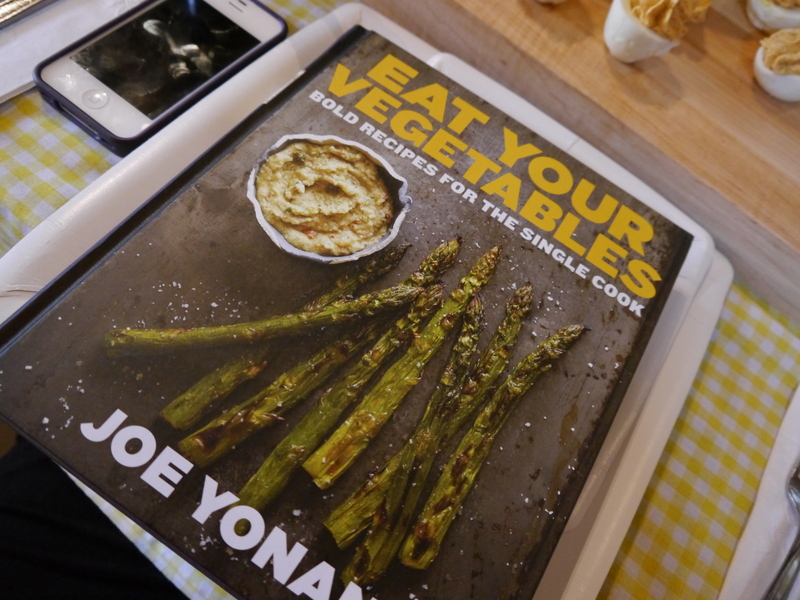 The first course included a few recipes from Joe Yonan’s new book! YUM! 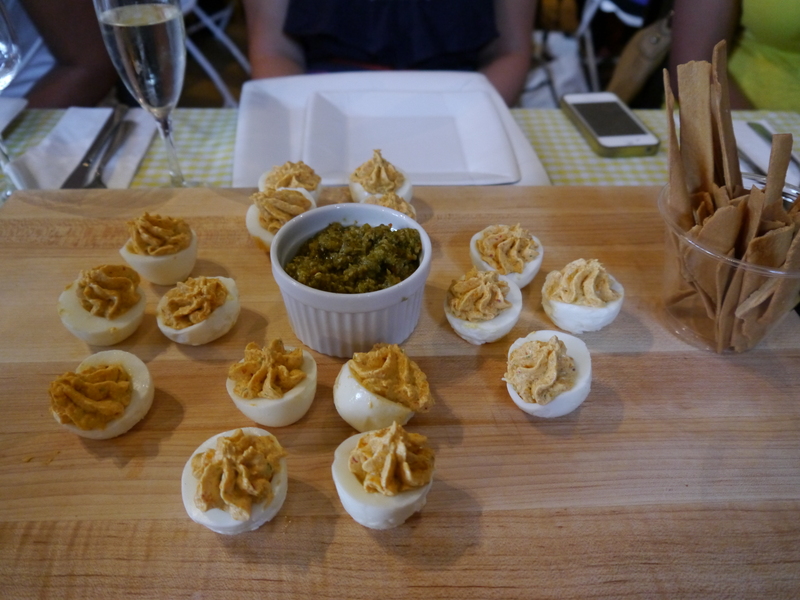 Kimchi Deviled Eggs and (holy moly.. ) Poblano Tapanade! 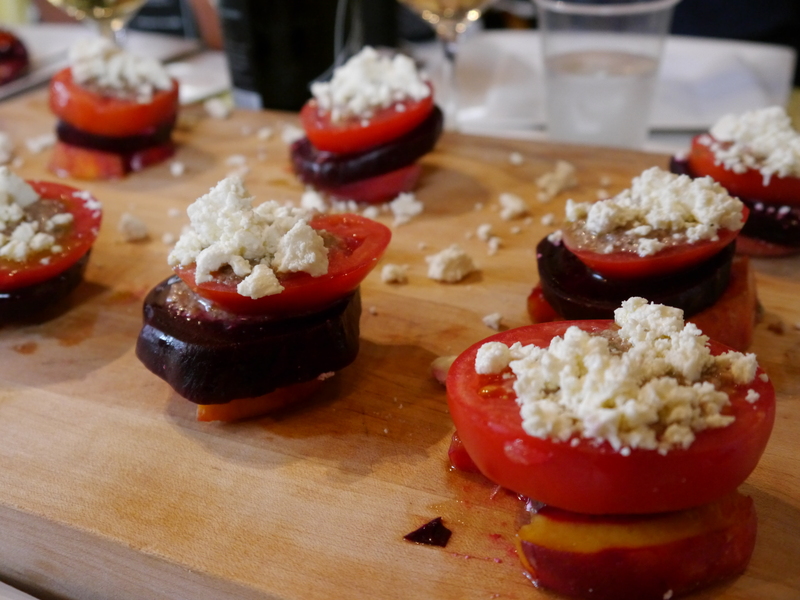 Next was some local tomato, peach, and beet stacks… melt in your mouth delicious. 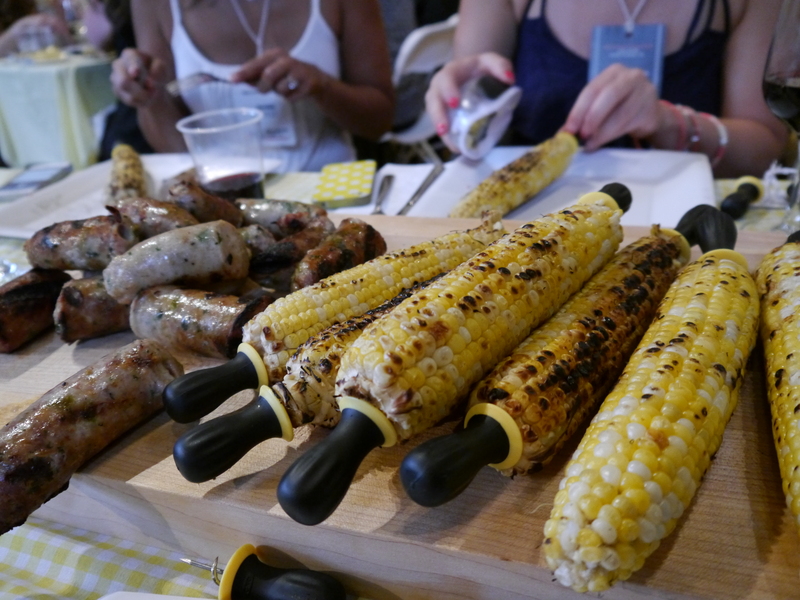 Then came our main course of grilled corn on the cob and some pretty fantastic Sausages: Spinach and Feta Chicken Sausage & Broccoli Rabe Pork Sausages. We ate soooo many! What was really awesome is that we got to play around with OXO (one of the fabulous sponsors)’s corn tools. It was so easy to get the corn off the cob that we ate two each… don’t tell! 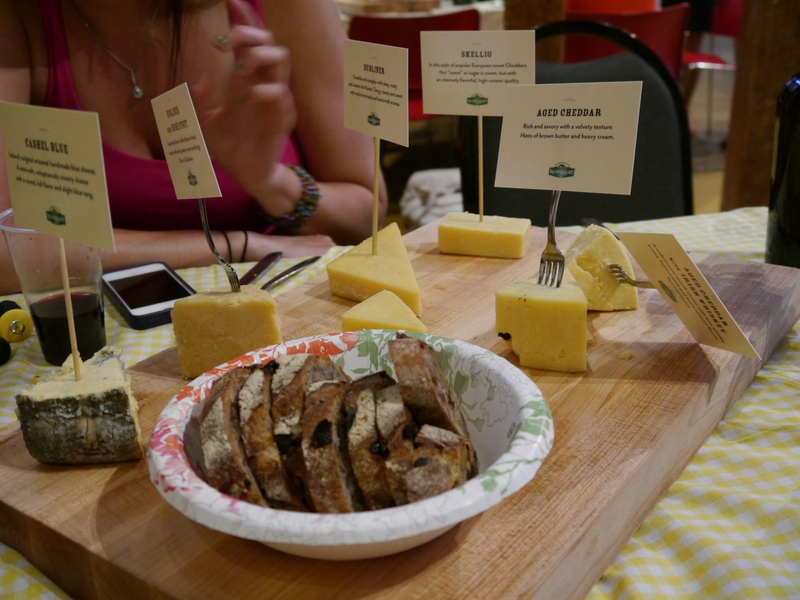 Next up we ate way too much Kerrygold Cheese and delicious Raisin bread. Like… way too much cheese. But amazing. 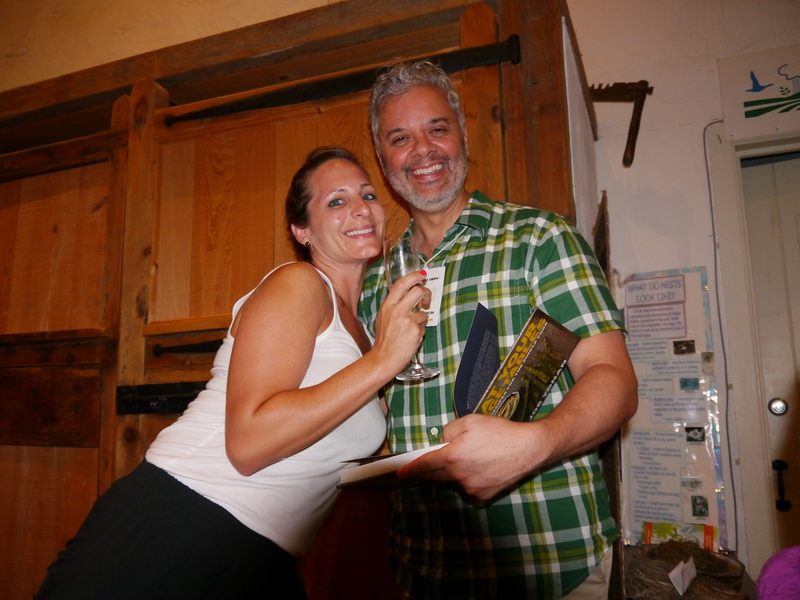 More giveaways and Tara got to take home a copy of Joe’s Eat Your Vegetables book… I’M JEALOUS!!!!!! 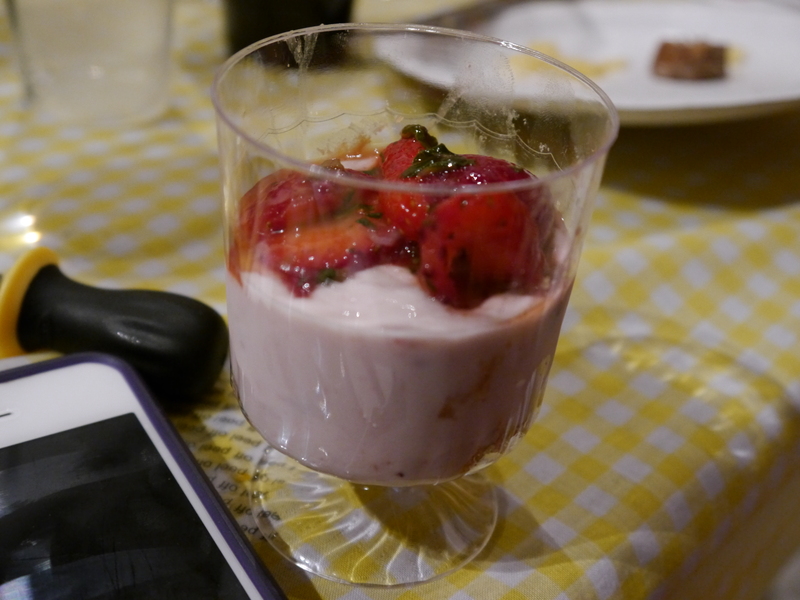 As if we weren’t already stuffed and tipsy enough- we were served a super yummy dessert, a Strawberry-Basil Shortbread Tart in a Jar. NOM NOM NOM! Loving the strawberry & basil combo here people. The bus took us back on the hour long drive and we crashed at the hotel. The next morning before having to say goodbye, one of the fabulous hosts, the Anderson family, welcomed all of us into their home for a huge brunch. They had cakes and cookies, breads, and my favorite: an Avocado Toast Bar. OMG! You know Avocado toast w/ Sriracha is one of my go-to snacks… I was very happy to see an entire bar for it with tons of toppings. YUM! Overall the weekend was just spectacular and so much fun to be apart of. Everything ran perfectly smooth. Thank you very much to the hosts (Erika, Maggie, and Pam), our hospitality officers (Chris & Karen) speakers, sponsors, potluckers, and of course all of the bloggers who were able to make it out. You rock! So jealous! Looks like you had such a great time. What a great description and summary of the weekend! I loved reading this and reliving the magic. Your pictures are fantastic, too! 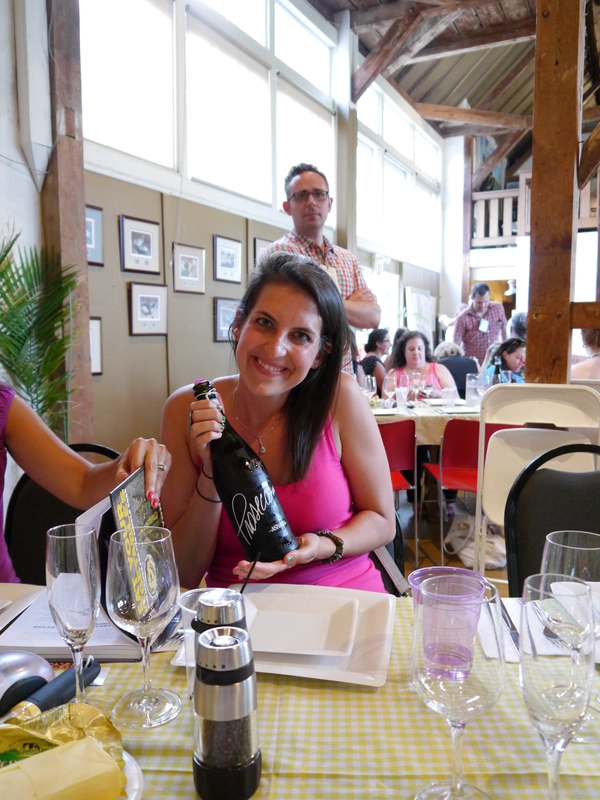 It was so fun to meet you and hopefully will see you again for some other blogger events soon!